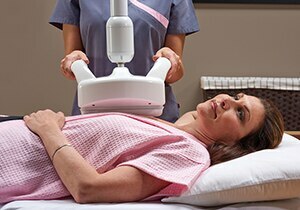 A 3D mammography system that is more inviting and more comfortable resulting in a better overall breast exam experience. A new ergonomic design to reduce physical strain with dedicated functionalities for easier patient positioning during the mammogram. The 3D acquisition protocol is made of a V-Preview + 3D CC/MLO with 3D in STD mode. The diagnostic set will include the 2D synthetized views of each acquisition. Don't your patients deserve the best? 1. Superior diagnostic accuracy demonstrated in a reader study comparing the ROC AUC of GE screening protocol (V-Preview + 3D CC/MLO with 3D in STD mode) to that of 2D FFDM alone. V-Preview is the 2D synthesized image generated by GE Seno Iris mammography software from GE DBT images. FDA PMA P130020 http://www.accessdata.fda.gov/scripts/cdrh/cfdocs/cfpma/pma.cfm?id=P130020.